ZipRoc is a music festival like no other. Set in the heart of Snowdonia with the spectacular backdrop of the historic Penrhyn Quarry and the world’s fastest zip line, this musical extravaganza starts with LHS’ Snowdonia Rocks – a 20k hike into the mountains – and ends with sets from some of the best musicians in Britain. With music from the headliners Cast and supporting acts Miles Hunt from The Wonder Stuff, Bryn Fon, Elin Flur, Mafia Mr Huws, Alffa and others, this evening has all the ingredients for one big celebratory party! ZipRoc 2019 sees the partnership between Love Hope Strength and Zip World grow into its second year. With the growth of the partnership comes a growth in ambition to raise more money to help make more of a difference for people affected by cancer. You can help achieve that by joining in with Snowdonia Rocks, taking on the LHS Zip Challenge on the same day, or coming along to ZipRoc 2019. ZipRoc promises to provide entertainment for all the family. Enjoy the VIP treatment or go for a standard ticket; either way you’ll get to enjoy the fantastic music, sample the local culinary treats on offer and relax in one of the most beautiful spots in the World. 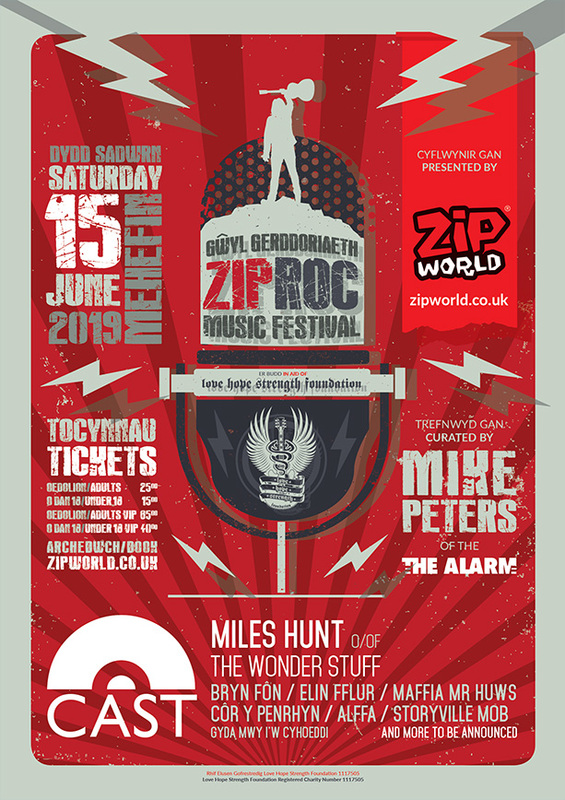 Further information including camping and local accommodation options will be posted on the ZipRoc Facebook event page, or for more information you can email zip@lovehopestrength.co.uk.